Many of the tax changes affecting individuals and businesses for 2016 were related to the Protecting Americans from Tax Hikes Act of 2015 (PATH) that modified or made permanent numerous tax breaks (the so-called “tax extenders”). To further complicate matters, some provisions were only extended through 2016 and are set to expire at the end of this year while others were extended through 2019. With that in mind, here’s what individuals and families need to know about tax provisions for 2016. The personal and dependent exemption for tax year 2016 is $4,050. The standard deduction for married couples filing a joint return in 2016 is $12,600. For singles and married individuals filing separately, it is $6,300, and for heads of household the deduction is $9,300. The additional standard deduction for blind people and senior citizens in 2016 is $1,250 for married individuals and $1,550 for singles and heads of household. In 2016 the top tax rate of 39.6 percent affects individuals whose income exceeds $415,051 ($466,951 for married taxpayers filing a joint return). Marginal tax rates for 2016–10, 15, 25, 28, 33 and 35 percent–remain the same as in prior years. In 2016 there is an exemption of $5.45 million per individual for estate, gift and generation-skipping taxes, with a top tax rate of 40 percent. The annual exclusion for gifts is $14,000. For 2016, exemption amounts are $53,900 for single and head of household filers, $83,800 for married people filing jointly and for qualifying widows or widowers, and $41,900 for married people filing separately. The basic standard deduction for a married couple filing jointly in 2016 is $12,600. Pease (limitations on itemized deductions) and PEP (personal exemption phase-out) limitations were made permanent by ATRA (indexed for inflation) and affect taxpayers with income at or above $259,400 for single filers and $311,300 for married filing jointly in tax year 2016. Flexible Spending Accounts (FSAs) are limited to $2,550 per year in 2016 (same as 2015) and apply only to salary reduction contributions under a health FSA. The term “taxable year” as it applies to FSAs refers to the plan year of the cafeteria plan, which is typically the period during which salary reduction elections are made. Specifically, in the case of a plan providing a grace period (which may be up to two months and 15 days), unused salary reduction contributions to the health FSA for plan years beginning in 2012 or later that are carried over into the grace period for that plan year will not count against the $2,550 limit for the subsequent plan year. In 2016 taxpayers in the lower tax brackets (10 and 15 percent) pay zero percent on long-term capital gains. For taxpayers in the middle four tax brackets the rate is 15 percent and for taxpayers whose income is at or above $415,050 ($466,950 married filing jointly), the rate for both capital gains and dividends is capped at 20 percent. For tax year 2016, the maximum earned income tax credit (EITC) for low and moderate income workers and working families increased to $6,269 (up from $6,242 in 2015). The maximum income limit for the EITC increased to $53,505 (up from $53,267 in 2015) for married filing jointly. The credit varies by family size, filing status, and other factors, with the maximum credit going to joint filers with three or more qualifying children. You can contribute up to $2,000 a year to Coverdell savings accounts in 2016. These accounts can be used to offset the cost of elementary and secondary education, as well as post-secondary education. A credit of up to $2,000 is available for an unlimited number of years for certain costs of post-secondary or graduate courses or courses to acquire or improve your job skills. For 2016, the modified adjusted gross income threshold at which the lifetime learning credit begins to phase out is $108,000 for joint filers and $54,000 for singles and heads of household. In 2016 you can deduct up to $2,500 in student-loan interest as long as your modified adjusted gross income is less than $65,000 (single) or $130,000 (married filing jointly). The deduction is phased out at higher income levels. In addition, the deduction is claimed as an adjustment to income so you do not need to itemize your deductions. For 2016, the elective deferral (contribution) limit for employees who participate in 401(k), 403(b), most 457 plans, and the federal government’s Thrift Savings Plan is $18,000 (same as 2015). For persons age 50 or older in 2016, the limit is $24,000 ($6,000 catch-up contribution). Contribution limits for SIMPLE plans remain at $12,500 (same as 2015) for persons under age 50 and $15,500 for anyone age 50 or older in 2016. The maximum compensation used to determine contributions increased to $265,000. In 2016, the adjusted gross income limit for the saver’s credit (also known as the retirement savings contributions credit) for low-and-moderate-income workers is $61,500 for married couples filing jointly, $46,125 for heads of household, and $30,750 for married individuals filing separately and for singles. Example: Sam Smith, an electrician, submitted a bid of $6,400 to a housing complex for electrical work. Per the terms of his contract, every two weeks for the next 10 weeks, he is to receive a payment of $1,280. This is not considered payment by the hour. Even if he works more or less than 400 hours to complete the work, Sam will still receive $6,400. He also performs additional electrical installations under contracts with other companies that he obtained through advertisements. Sam Smith is an independent contractor. Note: Labor laws vary by state. Please call if you have specific questions. The Net Investment Income Tax (NIIT) is a 3.8 percent tax on certain net investment income of individuals, estates, and trusts with income above statutory threshold amounts, referred to as modified adjusted gross income or MAGI. In general, investment income includes, but is not limited to interest, dividends, capital gains, rental and royalty income, nonqualified annuities, income from businesses involved in trading of financial instruments or commodities, and passive business activities such as rental income or income derived from royalties. Wages, unemployment compensation; operating income from a nonpassive business, Social Security Benefits, alimony, tax-exempt interest, self-employment income, Alaska Permanent Fund Dividends, and distributions from certain Qualified Plans are not included in net investment income. Investment income is generally not subject to withholding, so NIIT is going to affect your tax liability for the 2016 tax year. In addition, even lower income taxpayers not meeting the threshold amounts may be subject to NIIT if they receive a windfall such as a one-time sale of assets that bumps their MAGI up high enough to be subject to the NIIT. Estates and Trusts are subject to NIIT if they have undistributed net investment income and also have adjusted gross income over the dollar amount at which the highest tax bracket for an estate or trust begins for such taxable year. In 2016, this threshold amount is $12,400. Individuals, estates, and trusts that expect to be pay estimated taxes in 2016 or thereafter should adjust their income tax withholding or estimated payments to account for the tax increase in order to avoid underpayment penalties. For employed individuals, the NIIT is not withheld from wages; however, you may request that additional income tax be withheld. With another school year in full swing, now is a good time for parents and students to see if they qualify for either of two college tax credits or other education-related tax benefits when they file their 2016 federal income tax returns next year. Normally, a student will receive a Form 1098-T from their institution by Jan. 31, 2017. This form shows information about tuition paid or billed along with other information. However, amounts shown on this form may differ from amounts taxpayers are eligible to claim for these tax credits. The credit is available only if the student has not completed the first four years of post-secondary education before 2016. Scholarship and fellowship grants–generally tax-free if used to pay for tuition, required enrollment fees, books and other course materials, but taxable if used for room, board, research, travel or other expenses. If you have any questions about college tax credits, don’t hesitate to call. Taxpayers born before July 1, 1946, generally must receive payments from their individual retirement arrangements (IRAs) and workplace retirement plans by December 31. Known as required minimum distributions (RMDs), typically these distributions must be made by the end of the tax year, in this case, 2016. The required distribution rules apply to owners of traditional, Simplified Employee Pension (SEP) and Savings Incentive Match Plans for Employees (SIMPLE) IRAs but not Roth IRAs while the original owner is alive. They also apply to participants in various workplace retirement plans, including 401(k), 403(b) and 457(b) plans. An IRA trustee must either report the amount of the RMD to the IRA owner or offer to calculate it for the owner. Often, the trustee shows the RMD amount on Form 5498 in Box 12b. For a 2016 RMD, this amount is on the 2015 Form 5498 normally issued to the owner during January 2016. A special rule allows first-year recipients of these payments, those who reached age 70 1/2 during 2016, to wait until as late as April 1, 2017, to receive their first RMDs. What this means that those born after June 30, 1945, and before July 1, 1946, are eligible. The advantage of this special rule is that although payments made to these taxpayers in early 2017 can be counted toward their 2016 RMD, they are taxable in 2017. The special April 1 deadline only applies to the RMD for the first year. For all subsequent years, the RMD must be made by December 31. So, for example, a taxpayer who turned 70 1/2 in 2015 (born after June 30, 1944, and before July 1, 1945) and received the first RMD (for 2015) on April 1, 2016, must still receive a second RMD (for 2016) by December 31, 2016. The RMD for 2016 is based on the taxpayer’s life expectancy on December 31, 2016, and their account balance on December 31, 2015. The trustee reports the year-end account value to the IRA owner on Form 5498 in Box 5. For most taxpayers, the RMD is based on Table III (Uniform Lifetime Table) in IRS Publication 590-B. For a taxpayer who turned 72 in 2016, the required distribution would be based on a life expectancy of 25.6 years. A separate table, Table II, applies to a taxpayer whose spouse is more than ten years younger and is the taxpayer’s only beneficiary. If you need assistance with this, don’t hesitate to call. FSAs provide employees a way to use tax-free dollars to pay medical expenses not covered by other health plans. Because eligible employees need to decide how much to contribute through payroll deductions before the plan year begins, now is when many employers are offering employees the option to participate during the 2017 plan year. Interested employees who wish to contribute to an FSA during the new year must make this choice again for 2017, even if they contributed in 2016. Self-employed individuals are not eligible. An employee who chooses to participate can contribute up to $2,600 during the 2017 plan year (up from $2,550 in 2016). Amounts contributed are not subject to federal income tax, Social Security tax or Medicare tax. If the plan allows, the employer may also contribute to an employee’s FSA. Under the carryover option, an employee can carry over up to $500 of unused funds to the following plan year–for example, an employee with $500 of unspent funds at the end of 2017 would still have those funds available to use in 2018. Under the grace period option, an employee has until 2 1/2 months after the end of the plan year to incur eligible expenses–for example, March 15, 2018, for a plan year ending on Dec. 31, 2017. Employers can offer either option, but not both, or none at all. If you have any questions about retirement contributions or pension plans, don’t hesitate to contact the office. 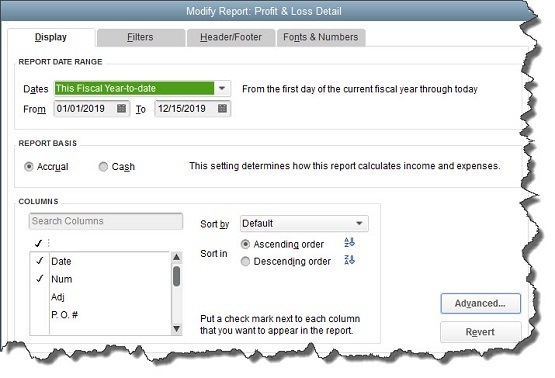 But perhaps you to see different columns than what QuickBooks’ report templates include. Furthermore, you might want to filter your output for more meaningful, targeted analysis. Some of QuickBooks’ reports–particularly those included in the categories Company & Financial and Accountant & Taxes–can be a little advanced for the average small businessperson with little bookkeeping experience. Yes, they’re easy to run, but they are also difficult to understand so you may need the assistance of a professional. We strongly encourage you to let an experienced QuickBooks professional run these more complex reports, such as the Balance Sheet, for you on a regular (monthly or quarterly) basis. Balance sheets provide valuable insight when making critical business decisions. But don’t be discouraged from working with QuickBooks’ reports on your own either. Some of the easier reports are A/R Aging Detail (to keep an eye on past-due payments) and Unpaid Bills Detail (to see where you stand with your own financial obligations). First, columns. Building reports from scratch would be too time-consuming and frustrating for you to do all of the time. And it’s unnecessary since QuickBooks provides templates for its reports, sets of columns and data filters that would serve some businesses well, but which can be modified by each user. Warning: Do you understand the difference between running reports as either Accrual or Cash? This is important. If you don’t, please call the office to go over some basic report concepts. If you want to work with the Advanced options, or if you come across a Display screen that puzzles you (depending on the report, you may have some complex choices). Please call for assistance if you need it. You can apply multiple filters to a report. Every one that you select will appear in the list under Current Filter Choices. The Header/Footer and Fonts & Numbers tabs are primarily cosmetic options you can explore on your own, but as you can see from this brief overview there are many ways to use QuickBooks reports as is or customized for your particular situation. We recommend that you work with reports regularly, both on your own and with a QuickBooks professional. The insight they provide can help your company grow and flourish instead of just getting by.